Sign Station Anoka Minneapolis MN designs and produces advertisng signs for business and personal purposes. Visit Cedar Rustics for ONLINE ORDERING of your personalized wood sign! Now you can place an order online for personalized wooden sand carved cedar signs for your cabin, cottage, barn, home, rec room, or boat. Great for gifts! Sign Station helps businesses and individuals Get Noticed by creating outstanding signs, vehicle graphics, displays, printing, and specialty products. At Sign Station we design and create many types of signs to help your business get noticed in a visually competitive marketplace. Sign Station produces signage that is temporary or permanent, signs that inform and direct, graphics that demand attention and inspire a response. Clicking through the portfolio pages in our website you will find examples of the displays, banners, vehicle graphics and signboard signs we have produced for our clients. One of our specialties is Gold Leaf for firetrucks, and you can find several pages devoted to this work. We have been making gold leaf fire truck graphics since the mid 1980's when founders Barbara and Maris Schilling were serving on the Andover Fire Department. The gold leaf work is produced just as it has been for hundreds of years, but now using technology as well as old fashioned hand lettering techniques to produce the embellishments and provide the protection and portability of the modern version of this traditional art. Sign Station also makes signs for your personal use. All of the same techniques and products used to make business signs are used for custom signs for cabins and lake homes, family reunions, weddings and other special events. 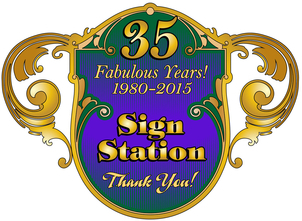 Any time you have a message to get out, Sign Station can help you choose the right product for the project. We will take special care to design your sign just right, or we can use designs provided by our clients.